Imagine June. A table at the edge of a porch overlooking misty Lake Geneva. Thunder storm brewing. Sparrows flitting in and out, trying to share lunch with a bunch of regulars and a few dazzled newcomers. And then, there arrives a perfect pea soup. 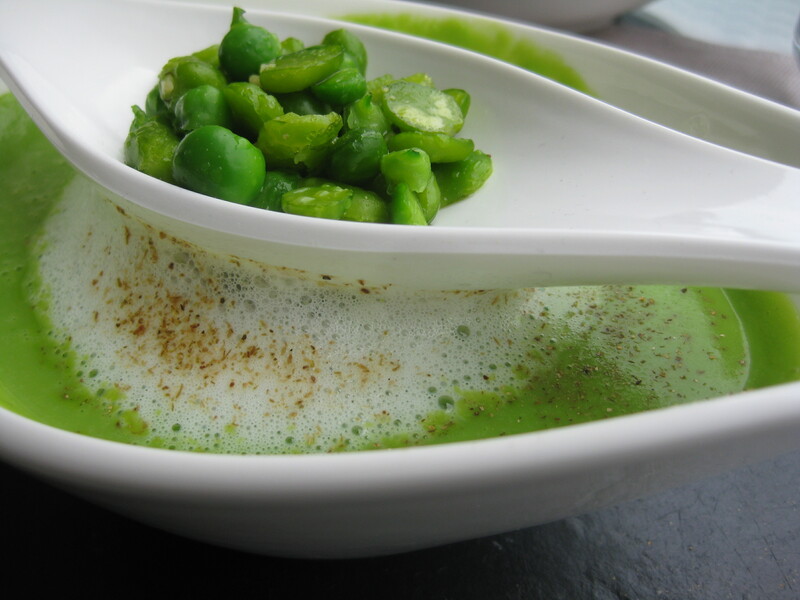 White scoop of barely cooked peas suspended over a bowl of hot soup with a floating island of foamed milk. What a great idea. Creamy but light. This will definitely be part of my expanding repertoire. Shell the peas. Set aside a few peas for garnish. Rinse the pods and simmer them in the stock or broth for 15 minutes or until they’re soft and have rendered their flavor to the liquid. Slowly sauté the leek or onion in butter in a medium saucepan. Add the peas and stir to coat. Add the broth and cook until the peas are tender but still green, about 6-8 minutes. Puree the pea mixture in a food processor and return to the pan. Season to taste. Drop the reserved peas in a small amount of boiling water. Froth the milk. When ready to serve, place some of the pea soup in a bowl, float the frothed milk on top, sprinkle with grated nutmeg and garnish with the reserved peas. If using the bacon, place it on the bottom of the bowl before adding the soup. It makes a nice, tasty surprise.